How to Perform Kaal Sarp Dosh Nivaran Puja on Shivratri at home? If you are suffering from Kaal Sarp dosh, then you can find relief from it after performing puja and rituals on Shivratri. Kaal Sarp dosh nivaran puja should be performed at night on Shivratri. Here is a brief idea on how to perform Kaal Sarp dosh nivaran puja at home. How to Perform Kaal Sarp Dosh Nivaran Puja? The person performing the puja should wear white color dress. Before starting the puja offer prayers to Ganesha in mind. The puja should be performed facing northeast or north. 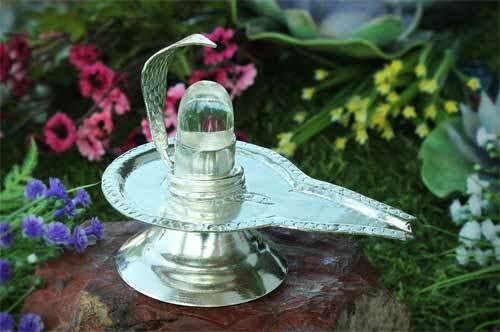 On a white color cloth, keep a shivling. If you do not have a Shivling, you can make one using turmeric powder. This can be later put under a bilva or peepal tree. Keep a small silver sculpture of nag (male serpent) and nagin (female serpent). If this is not there then you can draw the figure using turmeric on a plate. Light lamp using mustard oil (sarsom ka tel). Offer uncooked rice mixed with turmeric. Offer halwa as Prasad or bhog. This should be later shared with family members. Chant mahamritunjaya mantra 108 times. Keep count on a rudraksha mala. ओम् त्रयंम्बकं यजामहे सुगंधिं पुष्टिवर्धनं! On the next possible day, distribute white and black color blankets to poor people.